Tucked into the Radnorshire Hills of East Wales and appearing like a magical dream each year in late summer comes the Presteigne Festival, now in its thirty-third year, which for lovers of the deep countryside and of British Music and local history and Artists is a must. The festival embraces all aspects of the Arts, poetry and film included. I believe that it was James Callaghan the British Prime Minister who suggested that all politicians should spend at least a weekend in Radnorshire each year, presumably to give themselves a reality check and a calmer outlook after the stresses of their jobs. In a sense that applies now to many of the visitors who flock here on an annual basis despite the somewhat unpredictable weather. For composers and this year there have been seven commissions, it a joyous holiday which includes rare opportunities in some case, to hear often several of their works, for performers a relaxing space to work without noise and too much pressure and for the paying public and chance to mix music, lectures and fresh air, history and superb landscape and all in a gloriously informal and convivial atmosphere. St. Andrew’s is a fine and grand medieval church with an helpful acoustic is the main centre of activities as well as the town’s Assembly Room but the venues are also spread across into Herefordshire, as well as the small and delightful town of Presteigne, and in such places as Old Radnor church with its supposed connection with the Elizabethan composer John Bull, Pembridge Church famous for its 14th century timber belfry, Kinnerton Parish Church and the village halls at the wonderfully named Titley and at Evenjobb. I live locally so I was able to go to almost half of the events this year and came back with a few impressions to share and I tried to take in most of the significant British premiers, which I will concentrate on and one featured composer in particular that is Matthew Taylor. CDs of his music have been in circulation for a few years and he was 50 last year, so now is a good time to assess his quite considerable output which includes three symphonies, several concerti and now eight string quartets. He contributed a rather dark Rondino to a collaborative piece echoing Sibelius’s Five Pieces Op 81 for a recital given by Fenella Humphreys and Timothy End. That same evening we heard his masterly Variations on a Theme of Max Reger played by the Presteigne Festival Orchestra under George Vass, the main brains behind the entire Festival programming and the principal conductor. I was especially taken by Taylor’s String Quartet No 6 performed superbly by the Navarra Quartet on the Sunday afternoon in Old Radnor Church with its vigorous and powerful outer movements and the stillness of its middle ones. Influences might be Robert Simpson (Taylor conducted Simpson’s 11th Symphony), Beethoven and even Malcolm Arnold but the language was very much his own. On the last evening we heard the first performance of his Pastorals for Violin and String Orchestra played by Fenella Humphreys and the strings of the Festival Orchestra – a bitter-sweet piece in three perhaps overly similar movements but beautifully played by all concerned capturing the essence of the music perfectly. Taylor’s Wassail, three miniatures – drinking songs, great fun, early piano works shared in a piano duet recital by Joseph Tong and Waka Hasegawa which included John McCabe’s Upon Entering a Painting. A Rothko exhibition at the Tate Modern inspired the piece and McCabe’s harmonies helped to draw us into the inspiration. It was such a good idea to remember John McCabe across the five days of the Festival, a man whom Matthew Taylor described as “an alpha-plus musician” in the talk preceding the final concert. In this event we heard McCabe’s ten-minute tone poem Red Leaves beautifully conceived for a string orchestra with concertante type parts for two oboes and two horns that consistently play mini free cadenzas. An autumnal atmosphere indeed for September 1st. McCabe, I’m sure would have applauded the younger composer’s who are given a chance to be heard at Presteigne, for example Adrian Sutton and Michael Small in pieces for solo violin and played by the amazing Fenella Humphreys who tackled such a great deal of new music including her enterprising series ‘Bach to the Future’. More established figures appeared occasionally. It was good to have Cecilia McDowall at Presteigne to hear her wonderful Flights of Angels, a four movement song-cycle performed by Gillian Keith with pianist Timothy who both made terrific contributions to the Festival. Keith also sang the next day Three Housman songs by David Matthews orchestrated for strings at the request of George Vass. And it was Fenella Humphreys again who played Matthews’ challenging Three Studies for solo violin. There were several other living composers which it would be tedious to list but it was good to hear, both in the two services and in two concerts, some of Gabriel Jackson’s increasingly popular choral works especially his Countless and wonderful are the ways of God for chorus and string orchestra. The voices here were the hardworking Choir of Royal Holloway, who sang both services, put on a concert of their own (a capella) and sang in this concert on the Sunday evening including a wonderfully rhythmic and also poignant Triptych by Tarik O Regan. This is a very fine choir, directed by Rupert Gough who especially perform music by composers from Scandinavia and the Baltic countries, I shall for some time remember Eriks Esenvalds work Long Road, a wonderfully evocative and moving setting of a love poem performed at the end of their Pembridge concert which included parts for the descant recorder and bell tree. Two other young composers featured significantly. Thomas Hyde was present throughout the week even interviewing Matthew Taylor before Monday’s concert but his opera That Man Stephen Ward was performed alongside Charlotte Bray’s Entanglement on the first evening. Quite contrasting pieces they were too. Bray’s was in a distinctly modernist language, which was freely chromatic; Hyde’s totally eclectic and often quite tonal. But both works highlighted horrors of administration and justice: Ruth Ellis, the subject of Bray’s opera, was the last woman to be hanged in England after murdering her (abusive) lover; and Stephen Ward was almost by accident caught up in the Profumo affair and committed suicide. 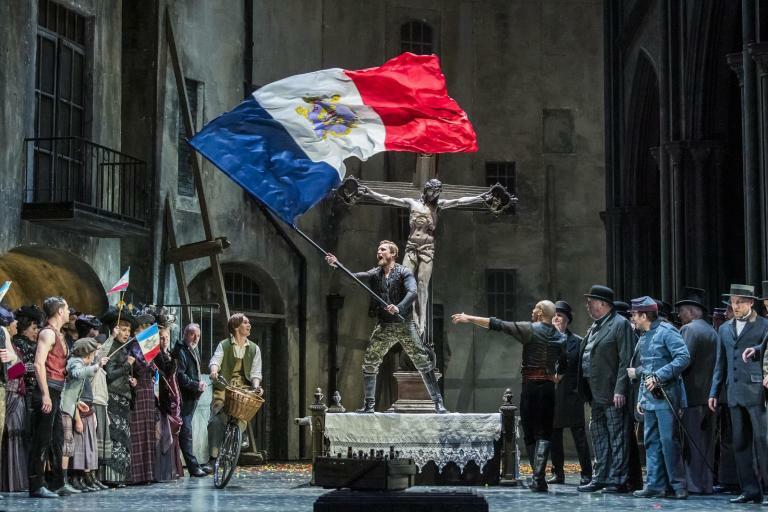 Of the two operas Hyde’s 50 minute one-acter had the most appeal but with only one singer (plus two silent actors) one wonders what future it may hold, especially to find a singer as exceptional as Damien Thantry to take the leading role. Charlotte Bray had just the three singers, Ruth, was sung with much understanding by Kirsty Hopkins, her lover by Greg Tassell whose lyric tenor could have been exploited even more thoroughly and Howard Quilla Croft as Desmond Cussen Ruth’s ‘sugar daddy’ who supported her financially was played in a somewhat non-descript manner. Despite these caveats it was a fascinating evening and a thought-provoking experience. I must highlight the work of the Navarra Quartet mentioned above and their no less than three recitals. I have mentioned one, in which Taylor’s Quartet was coupled with the Beethoven Op 132 but another included what was just the second performance of Edward Gregson’s 1st Quartet. This was ‘big-boned’ generous twenty-five minute work with two energetic outer movements full of tension and driving rhythms; the middle movement typified the sort of desolate landscape which one associates with certain aspects of Scandinavian music. Talking of which I should end with commenting on the works by the two main featured composers, Carl Nielsen and Jean Sibelius both born 150 years ago with works by Rautavaara thrown in for good measure. I couldn’t get to hear everything but programmed were Nielsen’s Serenata in Vano, his somewhat peculiar 2nd Violin Sonata, and his 4th String Quartet played wonderfully by the Navarra Quartet. There were audience members who told George Vass that they were now lovers of Nielsen whereas before they knew little about him, indeed they might well have attended the showing of a film made in 1970 by Barrie Gavin on the first morning, one lady described it as “being made in the golden days of BBC2 culture programming”. On the Monday morning Gavin was in conversation with David Matthews an event I would have liked to witness but there was, I believe, as ever a packed audience. And among the half dozen Sibelius pieces heard his Romance in C op 42 for Chamber Orchestra played in the same concert as Nielsen’s Serenata and a beautiful Suite for string orchestra by Rautavaara was a real highlight. Without the energy, determination and imagination of George Vaas nothing of this festival would happen. He accrues a marvellous group of musicians around him many of them young and enthusiastic and he has a very supportive committee and audience. I only wish we had more Presteigne festivals and indeed more courageous musicians like George Vass.